Live, Work, and Play at the Beach! How would you like to live Gulf-front and right on the beach? That dream can become a reality when you lease Beach Colony 18D with us today! 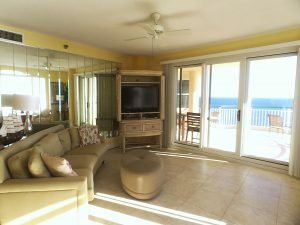 A spacious three-bedroom condo, this Perdido Key, Florida long-term rental is located at the desirable Beach Colony Resort in a penthouse space. 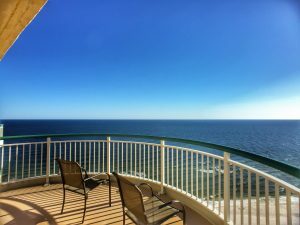 Enjoy gorgeous views of the Gulf of Mexico from the private, covered balcony. Your condo comes fully furnished and even includes a washer and dryer. This is one of the most coveted condos for rent in Perdido Key, so don’t miss out! See more pictures and schedule a showing here. Boasting nearly 2,000 square feet of space, there is no bad view at Beach Colony 18D. Lots of natural light pours in from the living room’s large sliding glass doors, with views as far as the eye can see! Whether you’re enjoying your favorite movie or a meal, you can watch the waves roll in. One of our favorite components of this condo is the cool tile floor throughout, which will help keep the sand at bay. In addition, a separate breakfast area is tucked away in a book off of the living room. If you thought those Gulf views were limited to the living room, then guess again! From the master bedroom, you can wake up and step out onto the balcony with ease. What a way to start the day! Granite countertops top off one of the many luxurious components throughout. Your master bathroom also has terrific views of the water from the comfort of the large whirlpool tub. Draw a bath, put on your favorite music, and unwind as you soak in the tub. The second and third bedrooms also have their own private bathroom. You’ll love all the fun found at Beach Colony in Perdido Key, including beachfront and indoor pools, hot tubs, a fitness center, and tennis courts. With a location just minutes away from NAS and a short drive from Downtown Pensacola, you’ll enjoy the tranquility of the beach life while enjoying the fun Pensacola and Perdido Key have to offer. Looking for more long-term rentals in Perdido Key? Search our inventory, and give us a call when you’re ready to find your next home! Copyright © 2019 Southern Residential Leasing. All Rights Reserved. Web Design by CYSY.